We have become aware that there may be cases of skipped frames in footage recorded in slow motion on the EOS C300 Mark II Digital Cinema Camera. We would like to offer our sincere apologies to customers who had been inconvenienced by this phenomenon. Canon will always strive to provide the highest quality products to ensure our products are used with confidence. ​Footage recorded in slow motion in Slow & Fast Motion Recording Mode, in 4K and 2K/HD, and at all frame rates, may have skipped frames. ​EOS C300 Mark II Digital Cinema Camera with firmware version 1.0.0.1.00 are affected. 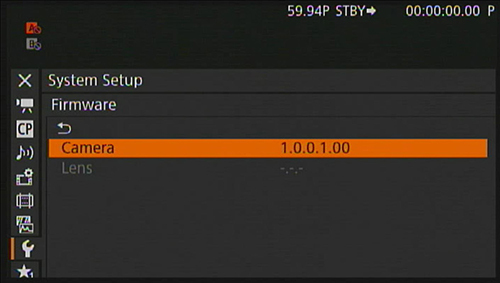 The camera's firmware version can be checked from [System Setup] on the menu. Press the MENU button, then select [System Setup] → [Firmware] → [Camera]. ​We are planning to release new firmware that incorporates a fix for this phenomenon in early November. Once the new firmware is ready, we will make an announcement on our Web site. Please contact your nearest Canon Service Center if you have any queries.